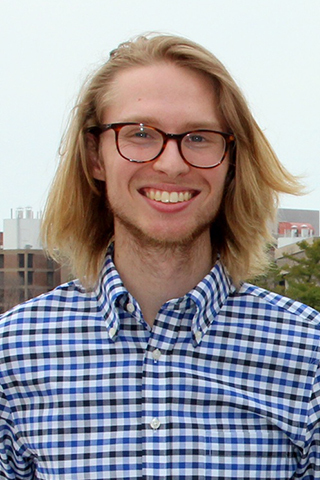 Jacob Isbell, a member of the University of Iowa Honors Program and the College of Liberal Arts and Sciences, has been named a 2017 Goldwater Scholar. The Goldwater Scholarship was established by Congress in 1986 in honor of Senator Barry M. Goldwater, to challenge and support outstanding young scholar researchers who are pursuing careers in the fields of science, technology, engineering, and mathematics. The Goldwater is the premier undergraduate award of its type in these fields. Isbell, of Garrison, Iowa, is a junior studying astronomy and physics with minors in computer science, mathematics, and geology. Isbell is currently conducting research on galactic evolution—specifically the effects of galactic collisions in the early universe—with Hai Fu, assistant professor in the Department of Physics and Astronomy. Isbell, who will receive up to $7,500 in funding for tuition, fees, books, and room and board, plans to pursue a PhD in astrophysics and a Master of Science in computer science upon graduation. Virtually all of them intend to obtain a PhD. The Goldwater Foundation also recognized UI junior Lance Heady with an honorable mention. Heady, of Quincy, Illinois, is pursuing degrees in biochemistry and neurobiology with minors in psychology, chemistry, and clinical and translational science. He is conducting research with Andrew Pieper, professor in the Department of Molecular Physiology and Biophysics in the UI Carver College of Medicine, on Huntington’s disease and potential therapeutics which alter the proteomic causes of the disease. Heady, an ICRU Ambassador and resident assistant for the UI STEM Scholars LLC, will be continuing his work on neurodegeneration this summer at MIT through the Amgen Scholars program. Isbell and Heady worked with UI Honors Program Director of Scholar Development Kelly Thornburg, the UI’s Undergraduate Fellowships Committee, and an invaluable community of faculty and research mentors during the development of their application materials. Since 1989, 53 undergraduate researchers from the University of Iowa have been named Goldwater Scholars. Isbell and Heady join UI 2016 Goldwater awardees Rae Corrigan, Erin Maier, Nicholas McCarty, and Tom Werner on campus. For more information about the UI scholars or applying for nomination, visit honors.uiowa.edu/goldwater-scholarship or contact Kelly Thornburg at kelly-thornburg@uiowa.edu.